A scale for continuous monitoring of patients in beds, stretchers, cribs or chairs. The 2250CE has a weighing mechanism comprised of four compact pods placed under the wheels of the bed. Each lightweight pod weighs only 5 1/2 lbs. The recessed portion of the pod is only 1/4" off the floor making it extremely easy for a nurse to roll the bed onto the scaleâ€”without lifting, without tools. The 2250CE features a computer-enhanced readout. Digital display of both total weight and weight changes. A â€œHoldâ€� control that freezes weight display when items are added or removed from the bed. An alarm to signal major weight changes. We also offer a more basic model, the 2250 without computer enhancement. This scale displays total weight only. Weighing Range - 0-600 kg. Readout - Digital LED display in kilograms. Power Source - 110 VAC, line cord operated. 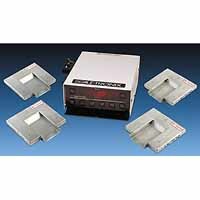 Weighing Pods - Four electronic load cell sensors (4 3/4" X 11 1/2"). Weight Change Indicator: Accumulates and displays changes in patientâ€™s weight. Alarm: Signals major weight changes.